Fairly and otherwise, the media often gets criticized for not speaking truth to power, especially on human rights issues. Why didn’t the media ask the government to take a stand on the dreadful human rights situation in Brutopia, or Thuggovia? And if our media did, why didn’t our politicians then raise those issues with the leaders of Brutopia while visiting that well-known human rights hellhole? Media: Prime Minister, do you plan to raise the persecution of the Uighur Muslims when you’re in China? PM: I tend to give general topics when I—before I go into meetings and then answer more specific questions when I come out of them, so happy to engage at that level again. It’s fair to say I have raised the issue before, and I have raised human rights issues before. Media: So do you plan to, in the current climate and given what’s recently happened? Hmm. So… human rights do get put on the “general topics” list heading in, and any subsequent media questions do get fielded afterwards. New Zealand has human rights concerns. These might extend to the treatment of X persons or Y groups. Fine. Duly listed, and duly noted. Now, what about those remaining barriers to finalizing a free trade agreement with Brutopia? It may seem an inadequate process – and it is. It is also difficult to imagine that even a moral lecture by a New Zealand PM would do much to improve the lot of the persecuted, or make the tyrants mend their ways. The only worthwhile and achievable point would be to make it clear what behaviours this country regards as intolerable, and whether anything at all would qualify as a deal breaker when it comes to the pursuit of more lucrative trade links. On that point, the media questioner’s reference to “in the current climate and given what’s recently happened” was a delicate way of raising the recent (and horrendous) evidence of China’s human rights violations. Notably, these include the punitive mass surveillance by the Chinese state of its Uighur peoples. This repressive surveillance apparatus has led to the imprisonment of up to a million Uighurs in internment camps for re-education and indoctrination purposes. The current repression of all forms of Islam (and Christianity) that do not meet Beijing’s definition of “co-existence” with socialism (ie submission to it) is the direct result of this policy directive. Mosques deemed to be out of step with “sinicisation” are being closed, and their adherents persecuted. It is not as if Islam is foreign to China. Islam has had a presence there for nearly 1,000 years, and Christianity has been part of Chinese society for 400 years. In January  China passed the five-year plan to Sinicize Islam at a meeting with representatives from Islamic associations from eight different provinces and regions. Few details have been released about the plan, but it is clear that shaping doctrine and traditions to conform to party objectives is central. Similar plans to Sinicize Protestantism and Catholicism in China have already passed, and swift implementation is expected. In Xinjiang, anti-religious efforts have been incorporated into a massive regional crackdown, including the mass detention of Islamic minorities. Arguably, this policy programme is not merely anti-religious. In the past, Beijing has found it less disruptive to co-opt religion rather than repress it out of hand. Today’s cycle of repression appears to be aimed at reducing the spread of foreign influences. Despite their centuries-long presences in China, it seems that Islam, Catholiciam and Protestantism are all being seen by Beijing as potential channels of beliefs and behaviours now regarded as alien, by an increasingly chauvinistic Communist Party leadership. So… Jacinda Ardern is about to visit China. The visit will pose something of a test for her recent rhetoric in Christchurch. If she really means that inclusive “You Are Us/We are You” messaging when she refers to Muslims, this surely has to extend to the Uighur Muslims now penned up in Chinese detention centres. (The umma has no borders.) 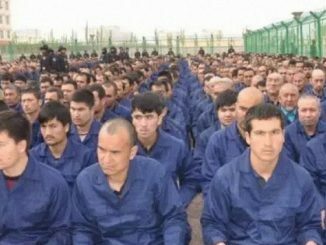 “We” right now, are being imprisoned and tortured in indoctrination camps strung right across Xinjiang province. It would be nice if Ardern spoke up firmly on “our” behalf, before she gets down to seeking ways for New Zealand to enhance its bilateral trade with the camp commandants. Talking of tyranny… This weekend’s local body elections in Turkey will test the success of President Recep Tayyip Edorgan’s campaign strategy – which has relied pretty much on (a) condemning Western Islamophobia by screening the Christchurch mosque attack video (b) stressing his history of opposition to United States policy in Syria and (c) blaming his domestic opponents for dividing the nation. The way he used the footage of the New Zealand massacre at election rallies last week was a horrifying and cheap political tactic, but it was also brilliant. It allowed Erdogan to highlight and reinforce ideas about Muslim solidarity, Turkish leadership, and an unredeemable West that have long been part of his and the AKP’s political repertoire. He clearly understands better than most that political appeals based on identity may have the power to overcome even bad economic news. Last year, as the government’s economic mismanagement led to a precipitous slide in the value of the lira and analysts were predicting that Erdogan would have to go to the IMF for help, the Turkish leader blamed the United States and appealed to God, making it a nationalist and religious virtue to oppose the logic of the markets. Even if Erdogan’s appeal for votes on the graves of 50 fellow Muslims does not work, there is every reason to believe that the AKP will do whatever it takes to ensure the outcome is in their favour. Asking such people not to behave in this fashion because its not right – as Foreign Minister Winston Peters asked Erdogan to do last week – tends to fall on deaf ears. Yes, Erdogan has seen how the West has admired Ardern, and he cynically joined that international chorus and flattered her in his Washington Post op ed. Back at home though, few Turks noticed his praise for Ardern. To the crowds at home, he has continued to portray the governments (and media) of New Zealand and Australia as Islamophobes who not only wrote the shooter’s manifesto, but handed it to him and sent him on his way to the mosques. Those tactics will probably serve Erdogan pretty well this weekend.